Odra Noel’s Map of Health, based on 2008 World Health Organization statistics, uses more than just colors to render information about global leading causes of death. 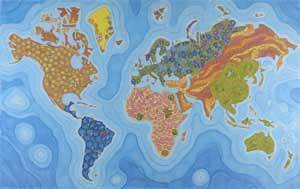 The map is made up of the artist’s rendering of various types of human tissue. The leading case of death, worldwide: cardiovascular disease. A beautiful rendering of hard facts – I wonder what a map drawn in 10 years from now might look like. Other coverage of old book sculptures and old books used as a canvas.